Emily Aviles: An outline of water related issues relating to collection and filtering. Emily finds this important because such complex problems will not have evident solutions within the four weeks of our stay in Ileret, but if enough data is collected proper work can be continued in the United States. This project is particularly challenging because tiny details which seem trivial may make a world of a difference to someone who has never been to Ileret. Konnie Xu: A detailed description of an organization she would like to start up, SIMBA. SIMBA stands for Strength in Millions Born to Achieve. This organization will focus on raising funds to send girls at Ileret’s primary school to secondary school. 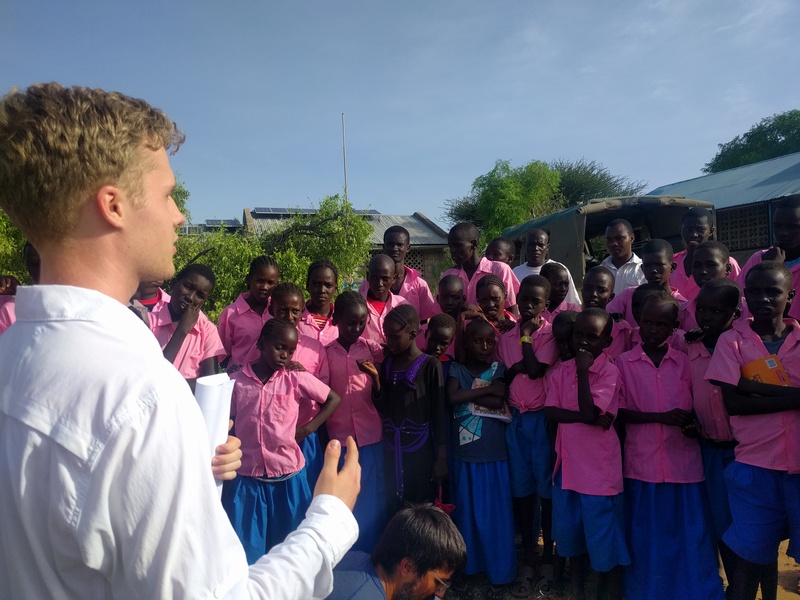 Secondary school is challenging to attend for many in Ileret because it requires students to dorm in Marsabit which is roughly 100 miles away from Ileret. Konnie hopes that providing an opportunity for funding will allow girls to follow their dreams and break the standard of gender roles here in Ileret. Natalie Lubaszka: Natalie’s project is inspired by the gender roles seen in Ileret. Many women here are socially restricted by daily chores, being married off for wedding dowries, and several other factors. Natalie believes that outlining inspirational women who have come from similar situations can have a huge impact on women of Ilerets’ motivation to overcome social norms. Sam van der Poel: An outline of troubles relating to the Photovoltaic system at Ileret’s primary school. While technology has been implemented in the past including solar panels, batteries, controllers, and inverters, many of the equipment has stopped working because it was not designed to handle the heat of Ileret or because it was not maintained properly. Sam is outlining current conditions and issues which occurred previously so any new projects will have a high chance of success. He believes that providing energy to Ilert’s primary school is essential for developing the community as a whole. Similarly to Emily’s project, Sam must be extremely detailed in reporting specific details. Winnie Wang: Winnie is inspired to give the children of Ileret, specifically girls, more reasons to attend primary school. 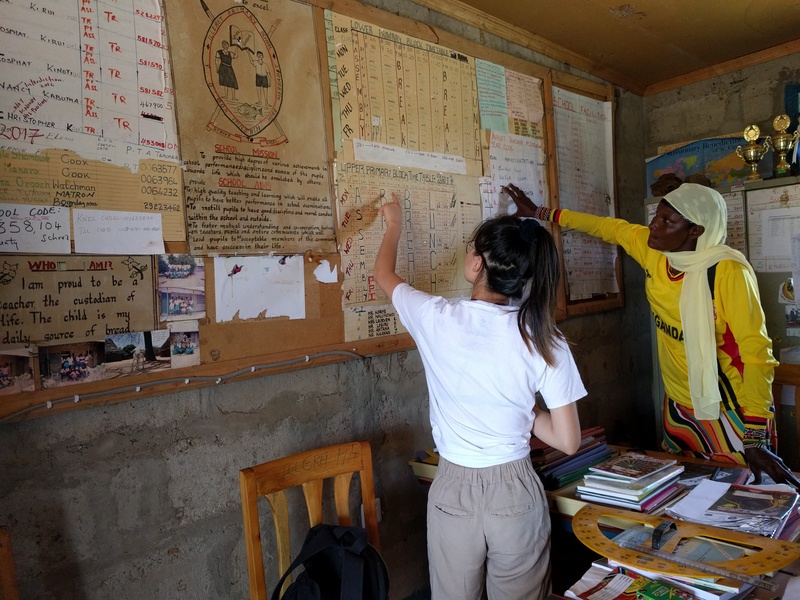 While many are motivated by food distribution (which is inconsistent at the moment) and activities, Winnie is motivated to outline several new opportunities which will make school a priority for all children in Ileret. 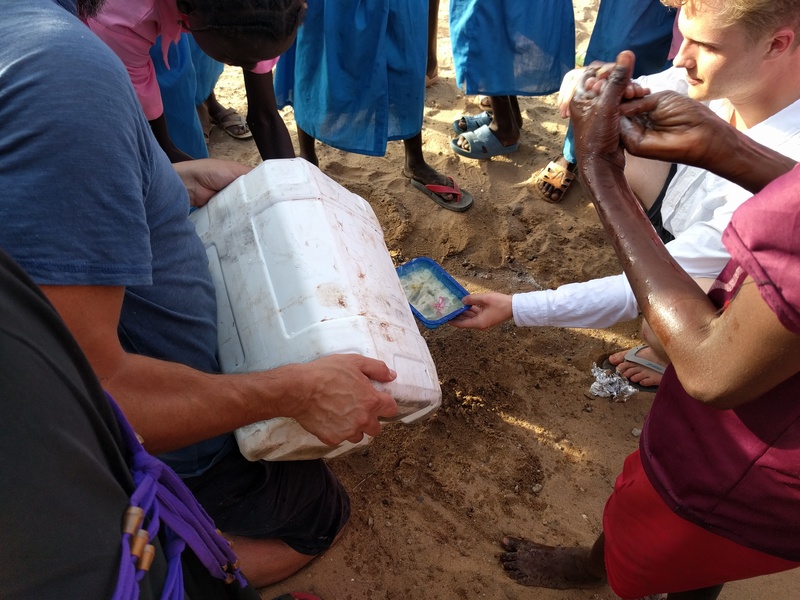 Later on Monday Sam van der Poel led a demonstration for his soap project (outlined in the previous blog) at Ileret’s primary school. This was an opportunity to educated students on simple chemistry and spread sanitation knowledge throughout the community. Having the lye portion of his solution ready, Sam heated up fat and mixed the lye in. In a few minutes the soap was ready and several students expressed excitement for trying this practice on their own. Sam van der Poel leading a soap making demonstration. Professor Rodrigo Peña (left) aiding Sam van der Poel (right) in making soap. Monday night ended with stargazing, an experience which no image could ever capture. The little to no light pollution at the Turkana Basin Institute (TBI) combined with no moon allowed us to see every star in the sky, featuring a couple of shooting stars. 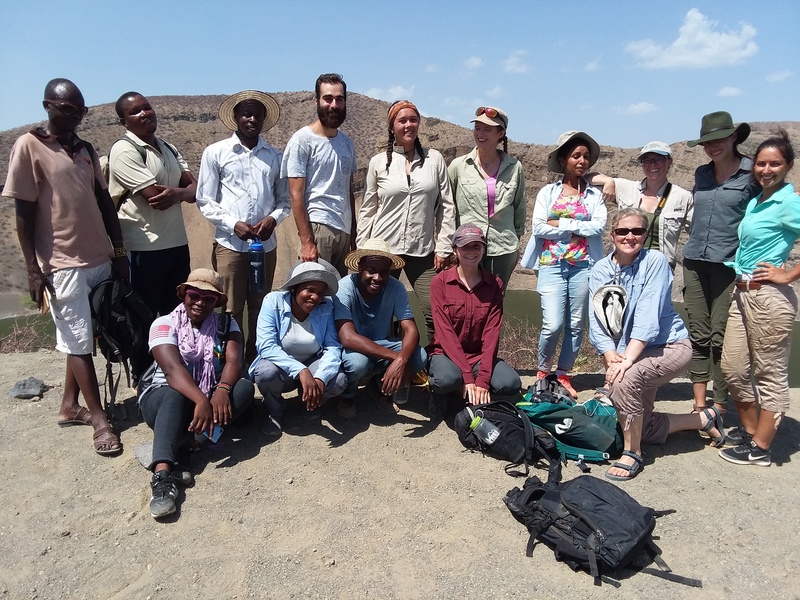 Tuesday morning we watched Bones of Turkana, a program which outlines the importance of TBI to the anthropology world and why anthropology is important in the first place. This gave a special meaning to our stay, as many students here did not know the history of TBI. After this several students went to Ileret’s primary school to gain information for their long-term projects. Winnie Wang talked to the school’s principal, Hildegard, who supplied information on daily schedules and student attendance. Winnie Wang (left) speaking with Hildegard (right). 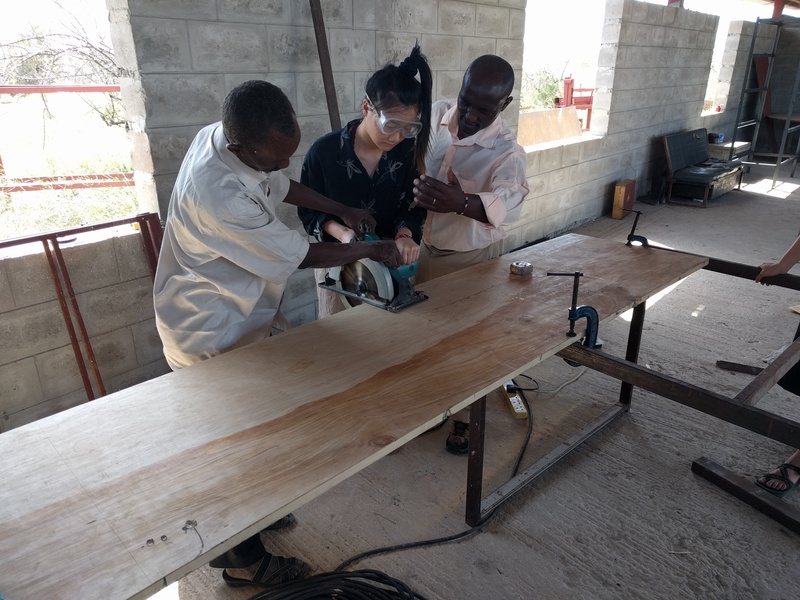 Sam van der Poel walked around the school with several people including a teacher named Peter, TBI’s Timothy, and Raphael Elimlim to analyze the current photovoltaic system. Also, Natalie Lubaszka talked with Raphael about several ideas regarding her project. 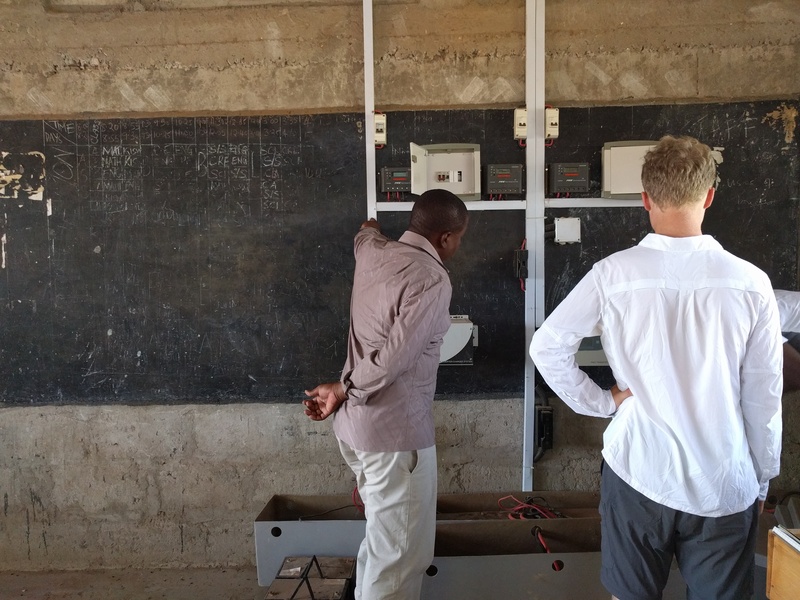 Sam van der Poel analyzing the photovoltaic system at Ileret’s primary school. 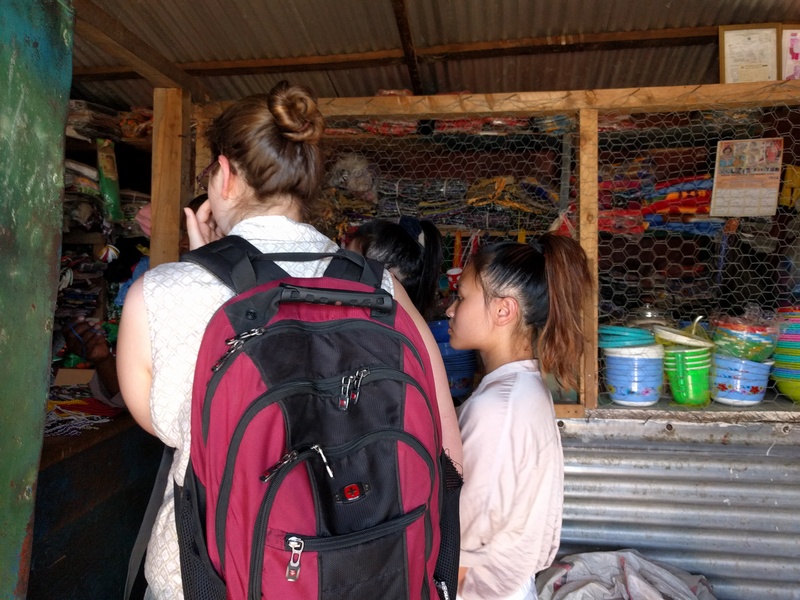 After visiting the school, Konnie Xu requested to stop in a shop for beads and string to make necklaces, as a portion of SIMBA will focus on selling authentic jewelry from Ileret as a fundraiser. While many items in the shop peaked the interest of students, necklace material was not found unfortunately. Konnie Xu (right) and Natalie Lubaszka (left) exploring a store in Ileret. Thursday ended with a soccer match and a fire to test Konnie Xu’s briquettes. While the briquettes did not catch fire, the Global Innovation crew still enjoyed a large fire fueled by wood collected generously by the TBI staff. 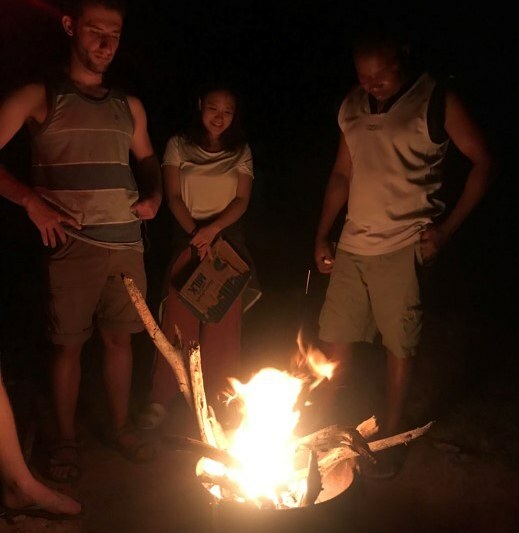 Joseph Kocaj (left), Konnie Xu (middle), and Timothy (right) enjoying a fire. Wednesday morning the team split up. 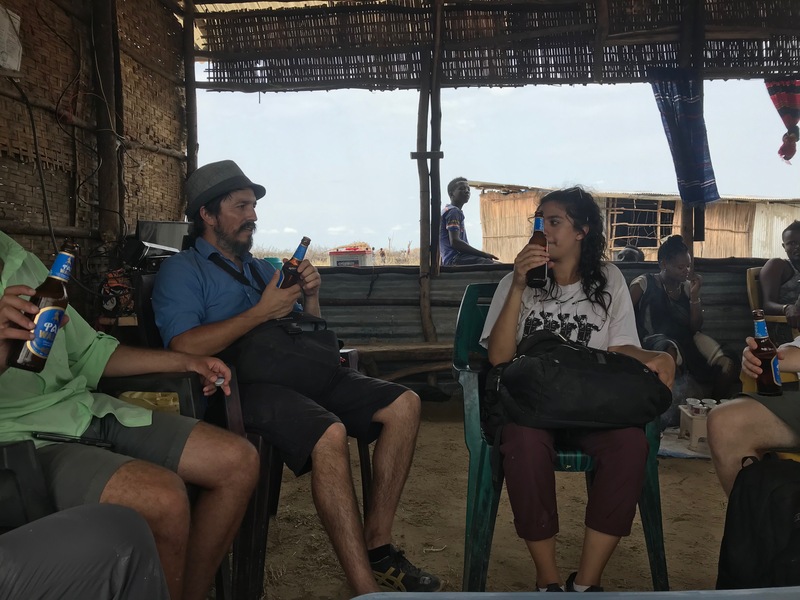 Professor Rodrigo Peña and Sam van der Poel went to the health clinic to continue the bat infestation removal project, started in the previous blog. 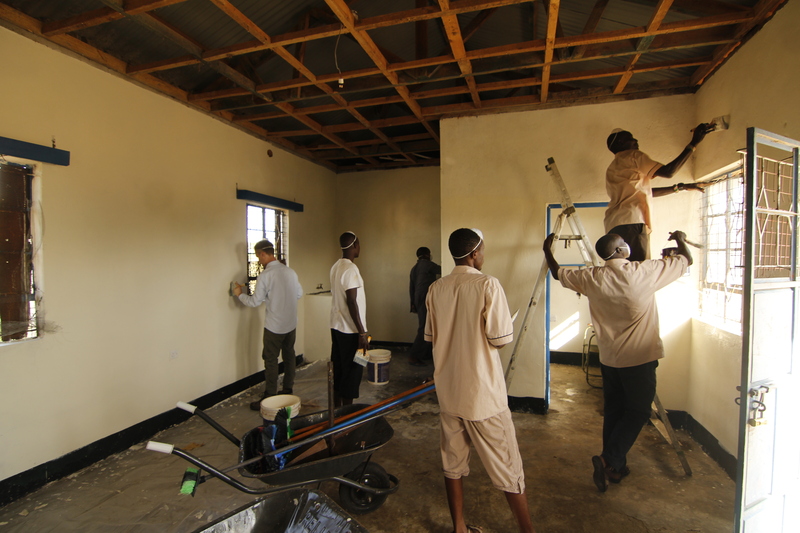 With the ceiling down and the room cleared it was time to clean the walls and floor and paint. 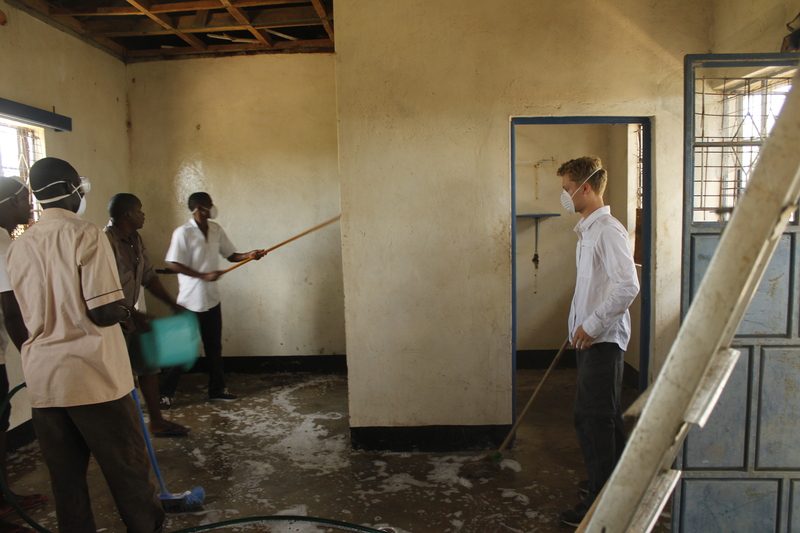 Sam van der Poel and a team of TBI staff cleaning a room before painting. Sam van der Poel painting with a team of TBI staff. 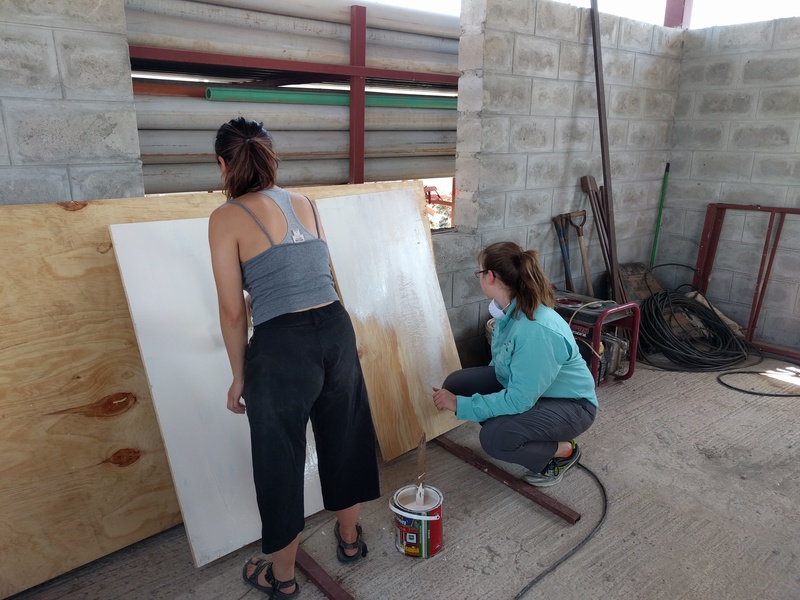 Teaching Assistant Joseph Kocaj, Winnie Wang, Emily Aviles, Natalie Lubaszka, and Konnie Xu stayed behind to work on construction of the shelves for the room Rodrigo and Sam were currently cleaning and painting. Mind that we are in an extremely remote location and there is not simply and IKEA up the road. The frames for the shelves required welding and the shelves had to be cut from large wood pallets. We mainly assisted with cutting wood and painting the shelves and frames. 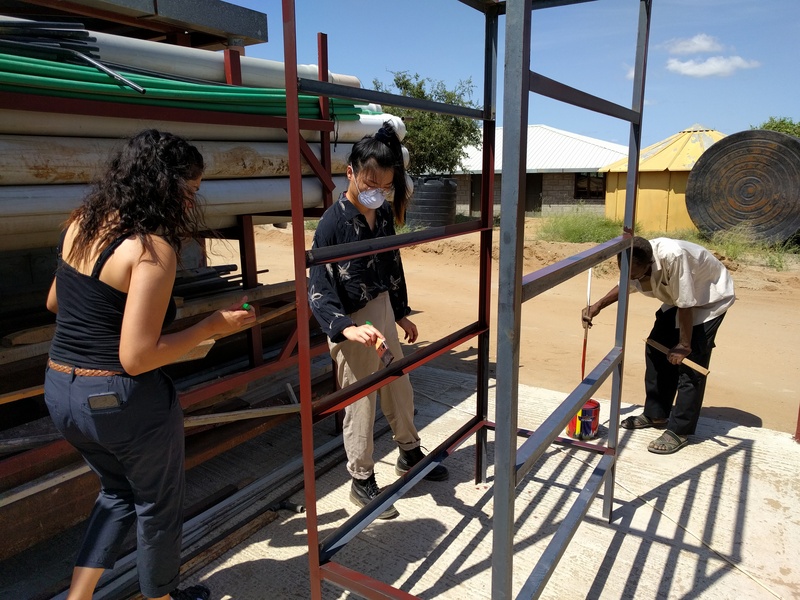 Emily Aviles (left) and Winnie Wang (right) painting a shelf’s frame with the help of Daudi. Konnie Xu (left) and Natalie Lubaszka (right) painting shelves. Later on the whole team met up at Ileret’s primary school to follow up on teaching the students how to play a recorder. On Thursday, the Global Innovation crew blew off some steam and played a game of manhunt during conferences about long term projects. The game is initiated by each player receiving another player’s name. The goal is to eliminate that player by whispering a code word. Hilarity ensued; after breakfast, all students and our professor ran off and used various methods of trapping their victim until one emerged victorious. 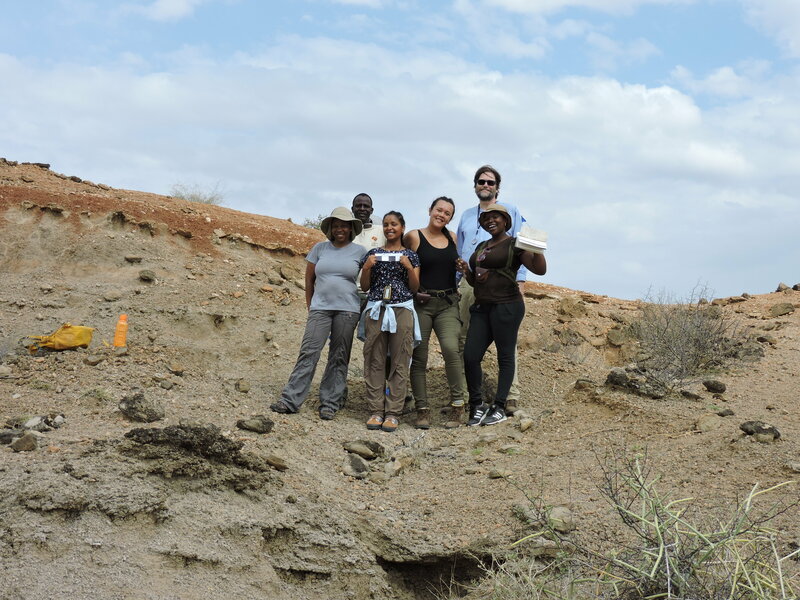 Following that, we all headed to the nearby Turkana Basin archaeological dig site. It was filled with hidden treasures and untold stories of the lives that existed there millions of year before. 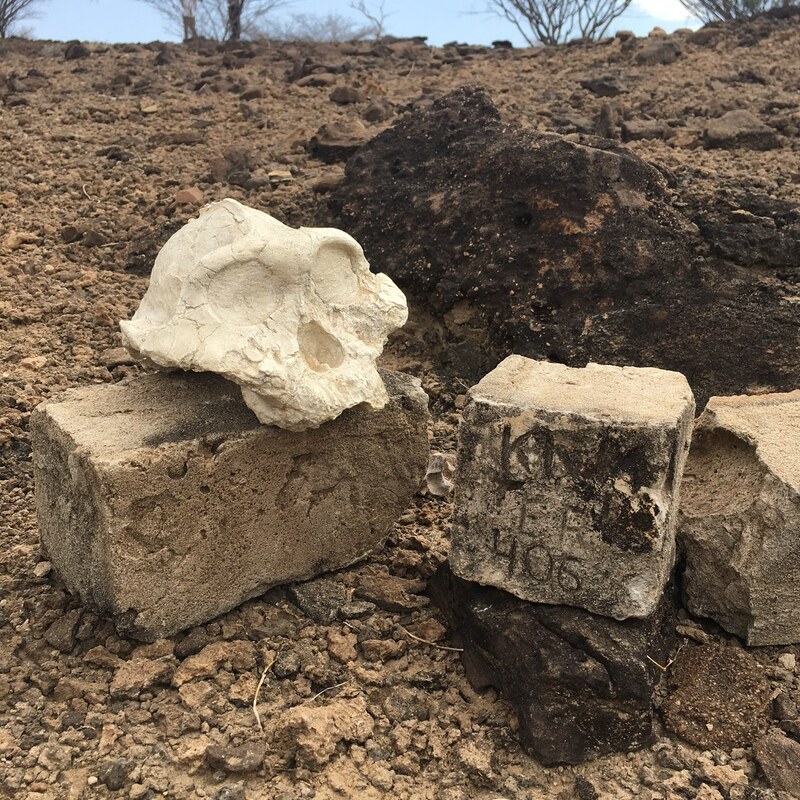 Where else could you stumble across the 1.8 million year old fossilized bones of a bird? 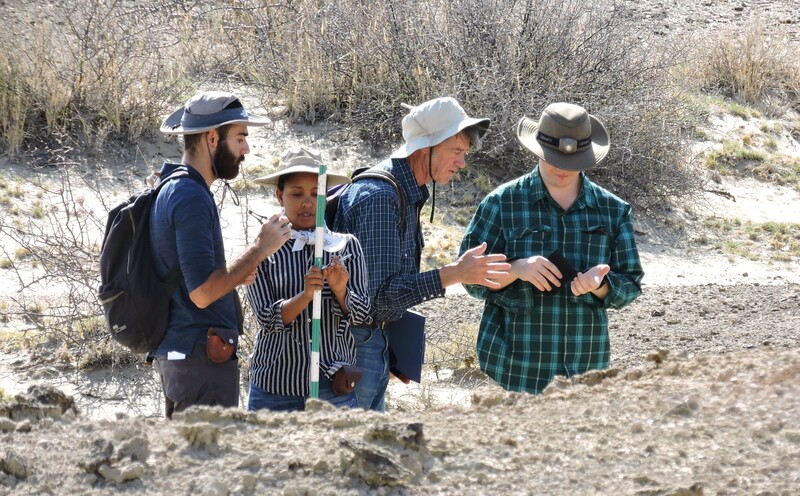 We were accompanied by various local fossil hunters trained to locate and identify the bones. 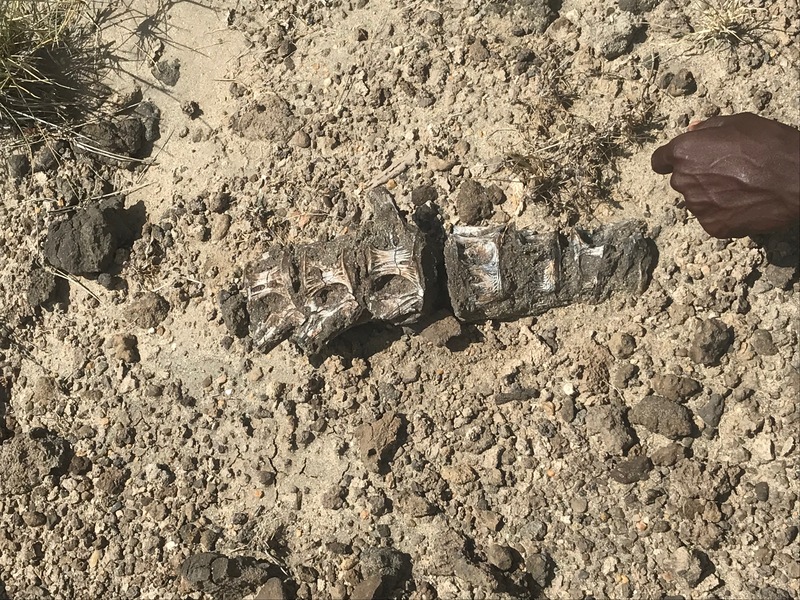 They were able to identify what part of the body every piece of bone on the ground was, and determine if it was a fossil based on sedimentation patterns. It was extremely impressive to witness how archaeologists work together to prove or disprove their answer based on the features of each specimen, even if it is weathered or broken. We came across huge fish backbones, a sharp molar from a monkey, various hippo parts, and much more. There were many shells and remnants of sea creatures, suggesting that the land we were standing on was once a river. 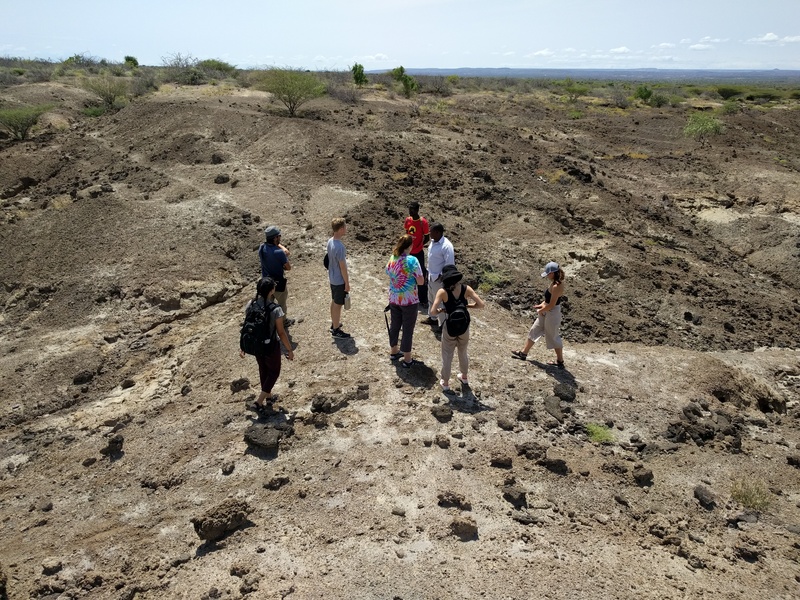 Students exploring an archaeological site. A fossil from a large fish. During the afternoon, the crew worked together with TBI staff to put in a final push of effort to paint all of the shelves and racks for Professor Rodrigo Pena’s health clinic renovation project. almost there! Some students and TBI staff congregated after painting to enjoy a game in the World Cup. Russia and Saudi Arabia battled it out, and Russia won 5-0! Friday morning the first room for the bat infestation removal project came together! 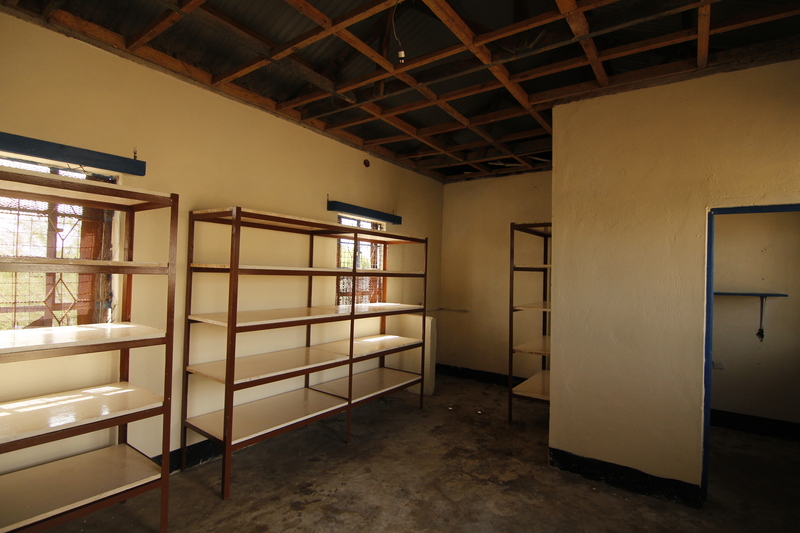 The shelves were transported to the clinic and assembled in the room. 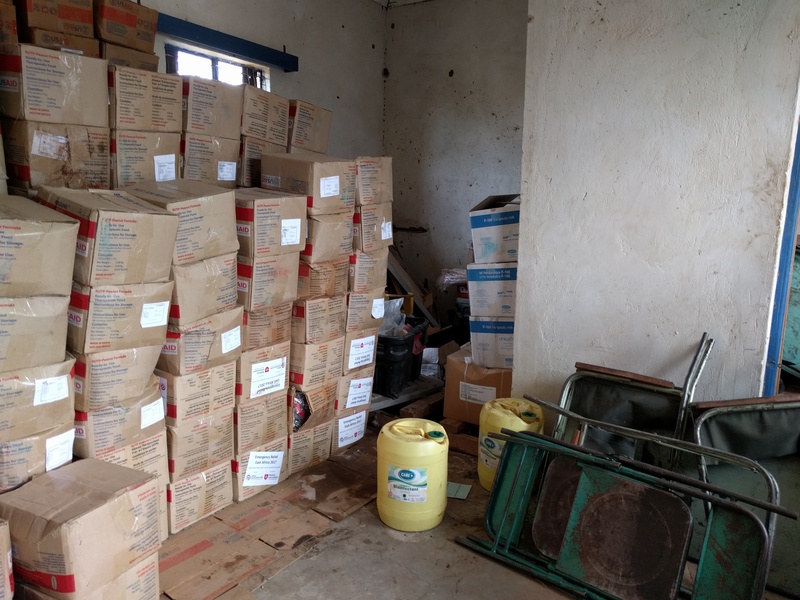 With the help of staff from TBI and women from the local community the shelves were being filled with malnourishment relief food boxes and other equipment. Friday also brought exciting news of Emily Aviles becoming an aunt to newborn Christopher Salvatore Giangano! The Global Innovation gang set out for an adventure early Saturday morning. 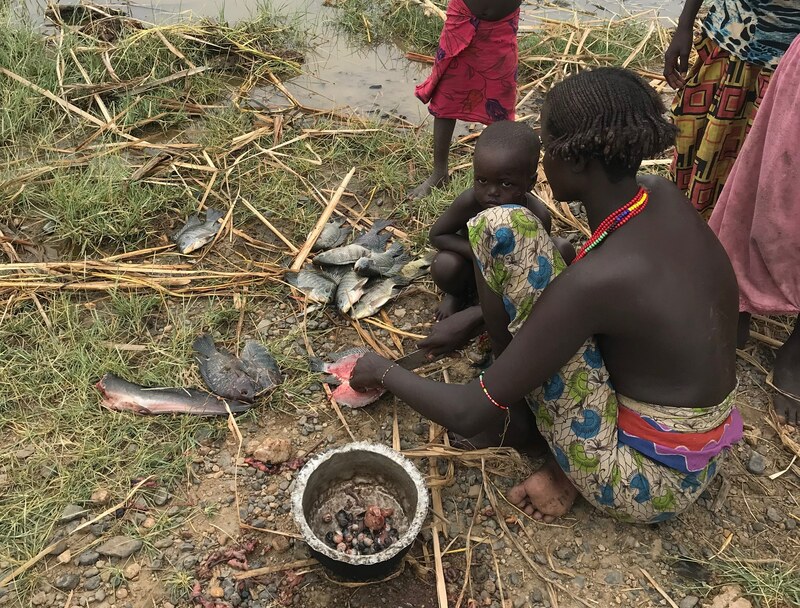 The first stop was to a Daasanach fishing village on the border of Kenya and Ethiopia where the people fish locally and sell to buyers instead of living a pastoralist lifestyle. Through fishing this village is able to set up an economy which allows for more infrastructure development in their community than other Dassanetch communities. 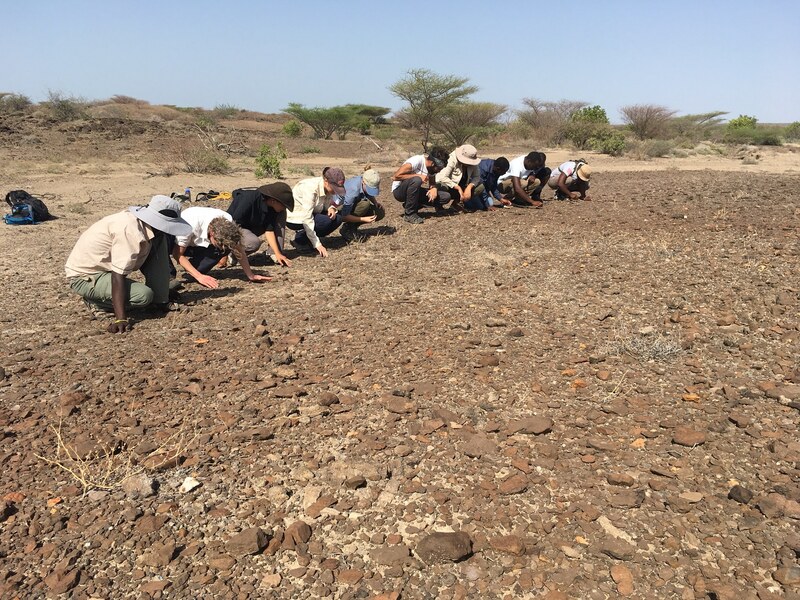 Walking north with a group of Daasanach children, we crossed the unofficial border to Ethiopia marked only by a rock. There, we witnessed a group of men butchering their daily catch. It was a huge nalpach, easily weighing at least 50 pounds. The rest of our time in Ethiopia was spent at a nearby bar. The experience was surreal; the smell of burning incense, the taste of ground coffee and mouthwatering espresso, students and the professor enjoying a malt, the chatter of patrons enjoying beers, Ethiopian music [specifically the song Sikuar (Sugar) by Aster Aweke] playing from a speaker, chickens loitering in the corner, and the view of women carrying water containers and various goods on their heads in the distance perfectly sets the scene. 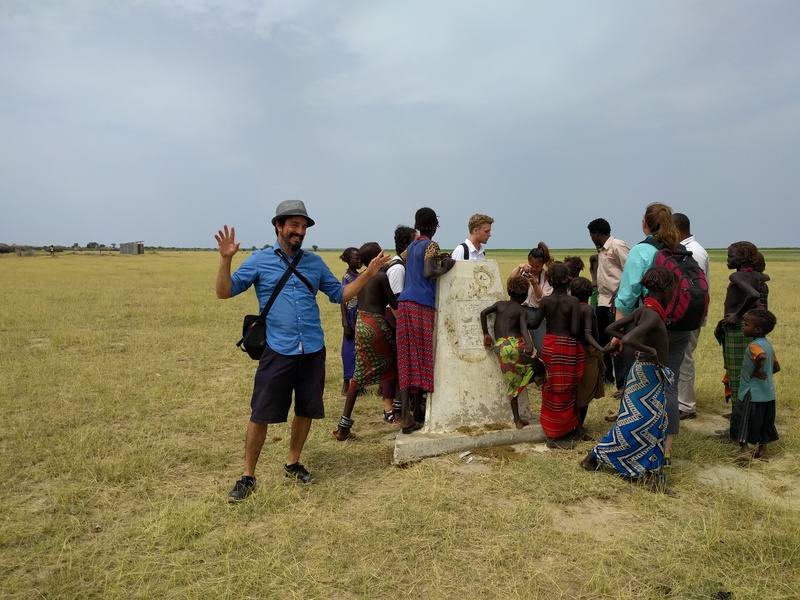 Rodrigo Peña enjoying the Kenya and Ethiopia border. Rodrigo Peña (left) and Emily Aviles (right) enjoying the Ethiopian bar. We finished the day with informal presentations from each student on their long-term projects, and a friendly game of truth or dare at dinner. 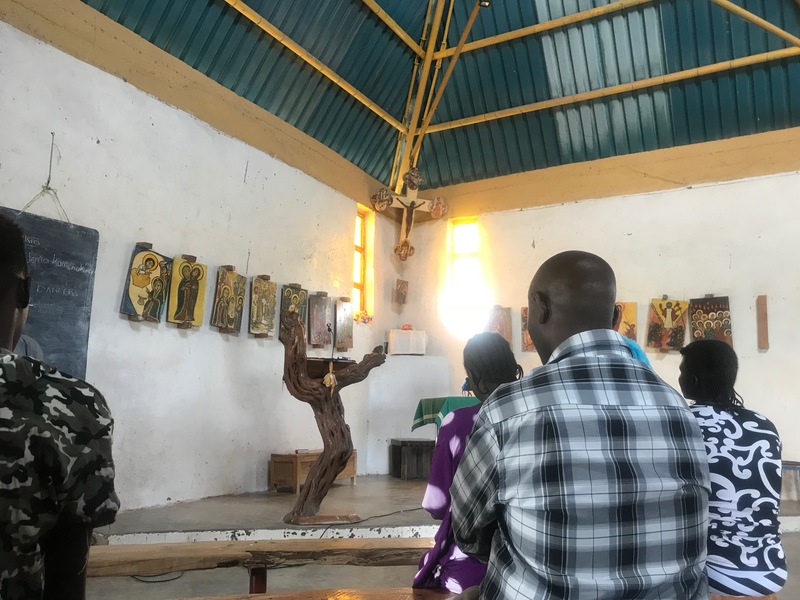 On Sunday, Mutuku and the students headed to church, established by a German priest almost two decades ago. The service was held in Swahili and the church was quickly filled with Dassanetch men, women, and children. We sat in the middle of the choir and got the full experience of singing, clapping, and dancing to religious songs. Though we were all the way in Ileret, the proceedings felt familiar to some students and we all joined in singing and clapping when we could. Waiting for Mass to start. It was also Father’s Day on this Sunday, so the students put together a video for professor Rodrigo Peña during their spare moments. The gesture was appreciated, and the group celebrated another eventful week in Ileret.